Designed for use by those having the responsibility for the administration and operation of motor vehicles as a part of organizational operations. 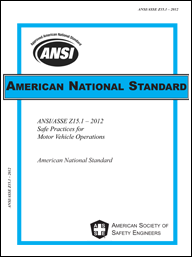 If you do not now have a “written motor vehicle safety program that defines organizational requirements, responsibilities and accountabilities for drivers and motor vehicle safety; a written safety policy that includes communicating management’s concern for the health and well-being of drivers throughout the organization; a system of responsibility and accountability in order to ensure effective implementation of a vehicle safety program,” this new ASSE standard can help you implement these best practices. SPEAKINGOFPRECISION SAYS: It is likely that this standard will be come the basis for regulatory enforcement as its best practices are adopted. This entry was posted on Tuesday, May 22nd, 2012 at 9:45 am and is filed under Front Office. You can follow any responses to this entry through the RSS 2.0 feed. You can leave a response, or trackback from your own site.